Acana Grasslands for cats is a nutritionally complete, cereal free food for both adult cats and kitten, designed to be biologically appropriate and fulfil your feline friend’s naturally carnivorous dietary requirements. Made with high quality protein sources, and containing 75% meat, including free-range lamb, free-run duck, nest laid eggs, and wild walleye fish as well as nutritionally balanced quantities of regional fruits and vegetables. 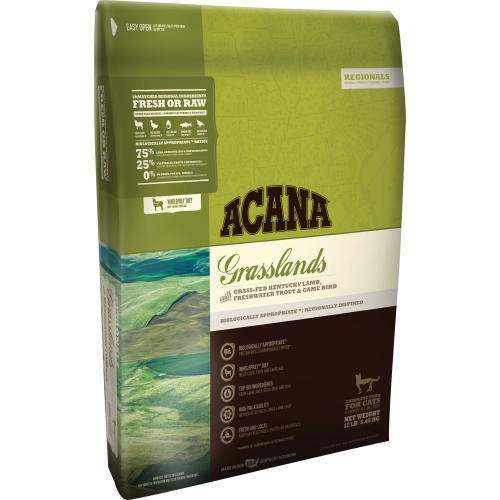 Containing vegetables such as butternut squash, carrots, spinach, and pumpkin as low glycemic index sources of carbohydrates, Acana Grasslands is free from preservatives and prepared from fresh ingredients to provide your furry friend with all the essential proteins and fats they require to thrive. Vitamin A 18 KIU/kg, Vitamin D3 2000 KIU/kg, Vitamin E 400 KIU/kg, Vitamin K 2 mg/kg, Vitamin C 83 mg/kg, Vitamin B1 (Thiamine) 55 mg/kg, Vitamin B2 (Riboflavin) 45 mg/kg, Vitamin B3 (Niacin) 230 mg/kg, Vitamin B5 (Pan. Acid) 45 mg/kg, Vitamin B6 (Pyridoxine) 30 mg/kg, Vitamin B12 (Cyanocobalamin) 400 ug/kg, Biotin 1.9 mg/kg, Folic Acid 3.2 mg/kg, Choline 3000 mg/kg.